Think it’s impossible to surprise your on-top-of-it girlfriend who plans every last detail of everything? 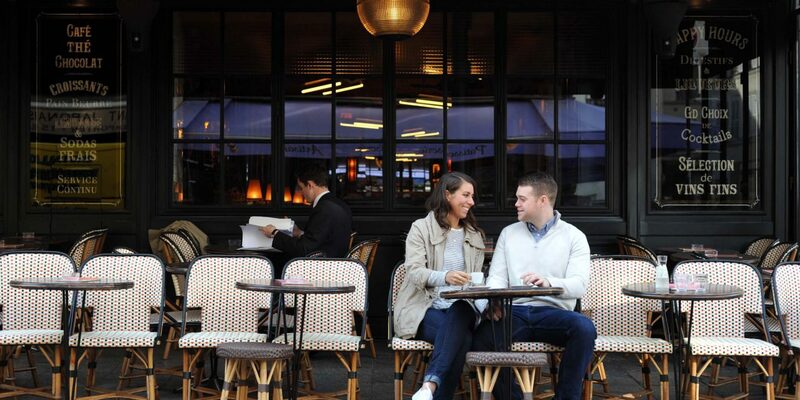 Even though Jenna is the one who thought she booked their Parisian vacation shoot, Jack swooped in and took the reins by secretly planning a proposal. Read on for their story. “We both arrived in Paris the day before we actually got engaged. Jack was jet lagged and I was exhausted from my work schedule from the previous weeks. We had an amazing picnic near the Eiffel Tower, did some exploring and then crashed early. When I say early, I mean it! We were out by 5:30 pm! “The next morning we had organized a photoshoot with Flytographer. Being such the planner I am, I wanted to make sure we had amazing pictures while in Europe. We (me being the ringleader) asked for a session for Christmas as a couple’s gift. I did this without having any idea Jack already had this in mind for when we were in Paris. I need to learn not to control every detail of situations, but wanted Jack’s first time in Europe to be care-free for him. Regardless, I was the one who had been in contact with Flytographer the entire time…or so I thought. My thought was that we could do this session to ensure we have amazing pictures where we travel because selfies only get so far, right? Since I set everything up, Jack had even more work on his hands and had to go around what I had planned to ensure his plan would happen, too. “We met Krystal in the morning and did some shots near markets and on the streets. We smelled the flowers, had an espresso at a local café and just tried to be ourselves – Krystal kept telling us to act naturally, so we tried to just converse (easier said than done). It was probably about 9:30 am and we walked to the park right below the Eiffel Tower. We were loosening up with Krystal and starting to feel a little less awkward with our pictures – well, at least for us, which is still VERY awkward! There were very few people in the park, which surprised me since it was such a beautiful morning. There was an organized run of some sort going on the weekend we were in Paris and they ran right around the Eiffel Tower area, slightly behind where we went so as we arrived ‘We Will Rock You’ by Queen came on. If that is not a sign, I do not know what is! Krystal was fidgeting with her camera and Jack and I were laughing about the song that was playing. Krystal said, ‘I have to change my battery’ and that is when Jack turned to me and said, ‘Jenna, I have to tell you something.’ I had a couple thoughts, but none of them were that he was going to propose. My first thought was that Krystal’s battery had run out quickly and my second thought was, ‘Not now – she is changing her battery! We need to have something to talk about when she tells us to be natural.’ Well, once he started talking, there was no question what was happening and honestly, my mind went blank! Thank goodness the only word needed from me was ‘yes,’ otherwise we may have been in trouble! He got down on one knee on the most beautiful day in Paris and asked me to marry him. I am so excited to marry him and be his wife! 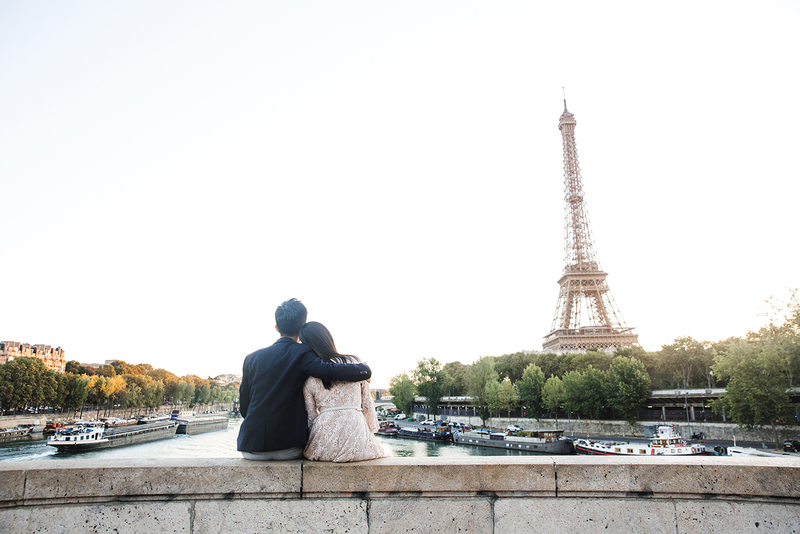 “Our trip to Paris offered the perfect engagement opportunity that I had been looking for – the most romantic city in the world! My only dilemma was how could I capture this moment that would be happening on the other side of the world, so that we would have it forever. In secret, I contacted the Flytographer team to let them know of my plan. Krystal could not have been more helpful – walking me through the best location, how to position myself to get the best pictures and we even worked out a secret cue so we both knew exactly when I was going to propose. “After custom designing her ring to match Jenna’s style and personality, I took a quick 18-hour trip home to Michigan to ask her dad for his daughter’s hand in marriage. We agreed to meet for a quick coffee and two hours later, I had his blessing and words of advice that I will never forget. A week later and after an 8-hour flight of constantly checking and rechecking that the engagement ring was still in my pocket, I arrived to meet Jenna in Paris. Our plan was to meet Krystal first thing the following morning. I could barely sleep, I was so excited (I only woke up three times to make sure the ring still hadn’t left my pocket). “We met with Krystal the next morning and had a blast laughing at each other while we took pictures holding hands through the streets of Paris, looking at flowers, and enjoying a coffee at a local café. It was a perfect morning. Finally, it was time to start walking towards the Eiffel Tower. My heart was beating out of my chest, but I tried my best to play it cool. I couldn’t believe this was finally happening. I was about to propose to the girl of my dreams in the most romantic city on earth. This was going to be amazing. I continuously ran my rehearsed speech through my head while I smiled and nodded at everything Jenna was saying, but I couldn’t hear anything but my own pulse. “We were now in position – directly in front of the Eiffel Tower. Krystal gave me the cue and I grabbed Jenna’s hands and turned towards her. In that moment I have never seen anyone look as beautiful as she did in that moment. It made me freeze. Then, out of nowhere, Queen’s ‘We Will Rock You’ started playing in the background. This made us both laugh and woke me up from my temporary daze. I got down on one knee, said my secret words to her, and she said yes!